Adulterous knitting never works well for me. I much prefer to be monogamous with my knitting projects. I also have problems with decision making. When I have multiple projects going on at once, I can never decide which one to work on. I end up knitting a few stitches on one project, putting it down & knitting a few stitches on the next, then picking up yet another project. None of them ever show any visible progress & I get frustrated. When I'm frustrated, I start a new project. It's a vicious cycle. Lately, I'd reached the point of indecision where I'd almost stopped knitting. Although I promised myself the Christmas socks (if they didn't turn out to be wine bottle bags) would be an at-work-only project, I decided to focus on them yesterday. At home. It was my day off. It's a sock! Or at least it will be. 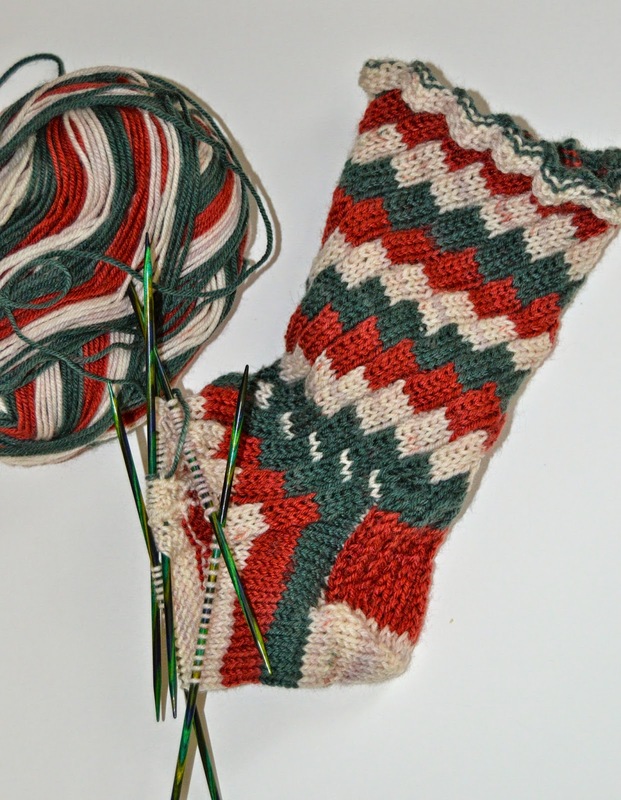 I'm loving the way the self striping yarn is working with the stitch pattern. It almost looks like entrelac. It's not though. It's just *k2, yo, k2, k2tog* repeated row after row after row. It's so simple! Thanks, Kate. Your'e right - I am definitely a serial monogamist!